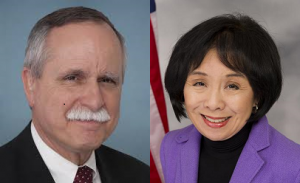 More hospitals need to tell their 340B success stories, say U.S. Reps. David McKinley (R-W.Va.) and Doris Matsui (D-Calif.). May 16, 2018—Two stalwart supporters of the 340B program in Congress appealed today for more help engaging lawmakers and more of the public in efforts to protect the drug discount program. Reps. David McKinley (R-W.V.) and Doris Matsui (D-Calif.) spoke at a May 16 Capitol Hill briefing sponsored by Vizient, a healthcare services company that contracts with 340B hospitals and other providers. Rep. McKinley is the sponsor of H.R. 4392, which would roll back $1.6 billion in Medicare Part B drug reimbursement cuts to many 340B hospitals that took effect Jan. 1. Rep. Matsui has reported that she is working on her own legislation to protect and preserve the 340B program. Rep. McKinley called on hospital attendees at the briefing to tell more of their 340B success stories to lawmakers. He noted that his bill is approaching 200 co-sponsors, which is within striking distance of a majority of members of the U.S. House. West Virginia University Medicine, a 340B health system in the congressman’s home state, was one of the health care providers presenting at the briefing. WVU Medicine expects to lose $10 million due to the nearly 30 percent reduction in its Medicare drug reimbursement. The cut threatens WVU Medicine initiatives including telemedicine consultations, mobile mammography services, and community health screenings. Rep. Matsui noted that many people still were unfamiliar with 340B, a situation that she described as “unfortunate” because it gives rise to misinformation about the program. Telling more success stories will help combat this misinformation and stop 340B from being a “scapegoat” for high drug prices, she said. The congresswoman told the success story of One Community Health, an HIV/AIDS clinic in Sacramento that relies on 340B savings to help serve its patients. Scaling 340B back, she said, would lessen its ability to expand and improve patient care. Attendees at the briefing also heard presentations from Jackson Health System in Miami, Maricopa Integrated Health System in Phoenix, and Virginia Commonwealth University Hospitals in Richmond, Va. These systems highlighted how they use 340B savings to help treat vulnerable patients and provide free or discounted care.